Some hotels are not just hotels. They have a concept. They sometimes are the concept. Take the Murano Urban Resort. You might wonder what the term urban resort could possibly mean? Close your eyes, let your imagination run wild and figure out a luxury beach resort transposed in the middle of Paris. You get the picture? You see a small, heated outdoor pool just there on your Parisian terrace? Welcome to the Murano Urban Resort. Behind its unremarkable façade, that doesn’t give anything away, is hidden a trendsetting and some say “aggressively minimalistic” hotel. It’s for modern nomads who will just need to plug their iPods into the Bang & Olufsen sound system to feel at home. It’s definitely the new generation of luxury hotel clientele on which they focus at the Murano. Walk into the clinically white lobby with its long, minimalist fireplace running the whole length of it and you’ll immediately get the message. This place is not meant to be cosy. This place is meant to be cool. You definitely will not lounge around with a book here. Sit down on the white leather chesterfield and be aware that you are part of the picture now. On your right a photo shoot might be going on, on your left the DJ is probably already preparing for the after-work session. The motto of the Murano - when sleeping is not enough – says everything. At the Murano they want to surprise you. Lifts and corridors are strikingly dark. And the day I visited the hotel, the press officer shrieked with fright, because she hadn’t seen her colleague arriving and ran into a man in a dark suit. This is the trouble with concepts: you must like them, otherwise you’ll be lost. The hotel is cool. No doubt. 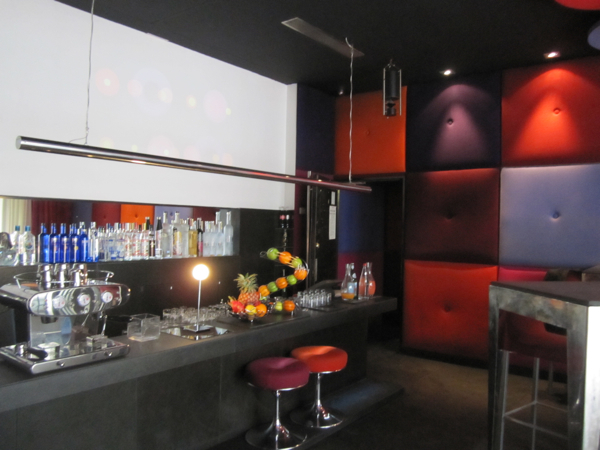 Once you’ve tasted a few of the more than 100 varieties of Vodka in the bar, you don’t need to scrabble around in your pocket for the key or the card, just pretend to be James Bond and unlock your room by digital fingerprint. Cool? Told you. And the design itself? The 43 rooms and nine suites of the hotel are all white, luminous and equipped with changeable mood lightening and different kind of curtains to create the atmosphere you want. 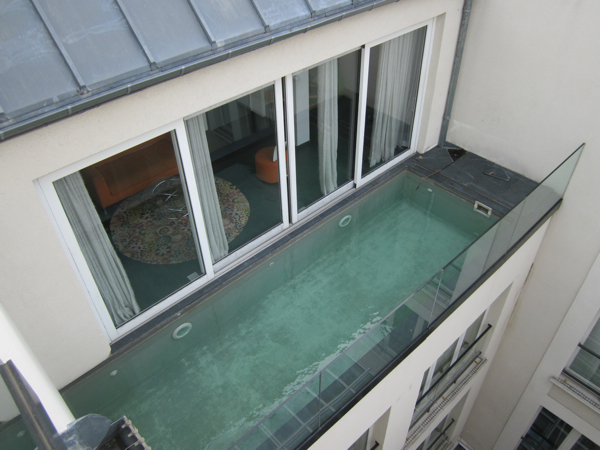 Two of the suites have a rooftop terrace with heated pool. Don’t think about your carbon footprint, just dive in. One of them is the honeymoon suite, the one Rihanna prefers to stay in when in Paris. All this hyper hype might not be every ones cup of tea. The basic idea of the Murano is very appealing though: This new generation hotel likes to provide everything, any time. You like to have breakfast at noon? No problem. You need a very late checkout? They’ll arrange this. Even if you’re not staying in the Murano, you can enjoy its spirit. After a light lunch and a shopping spree in the Upper Marais, on whose borders the Murano is ideally situated, you will even have the possibility of a power nap. Everything, any time, as I said – if money isn't an issue.